The Samsung Galaxy S4 zoom measures 125.5 x 63.5 x 15.4mm, the same height and width as the S4 mini, but thicker. Obviously. The actual number doesn't tell the whole story as the device itself isn't all that thick, save for two key areas - the lens and the grip. The first is out of necessity (you can make a 10x lens only so thin) and the other's for the sake of ergonomics. 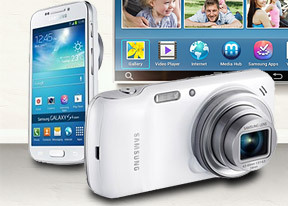 The Galaxy S4 zoom has two faces - that of an S4 mini on the front and a Samsung camera on the back. The design of the S4 zoom is fundamentally the same as the Galaxy Camera's, tough Samsung has moved some things around. If you ignore the back for a second, the device is almost identical to the mini, except the volume rocker is now on the right side. This allows you to use the Zoom in the same way you would the S4 mini. For snapping photos, the grip offers a good hold of the device and you can shoot one handed without worrying you'll drop it. Samsung's favorite hyperglazed plastic is rather slippery which isn't ideal but isn't a deal breaker either. The arrangement of the controls is fairly comfortable, whether you use the Galaxy S4 zoom as a phone or as a camera. Not in equal amounts though - holding it horizontally by the grip is a lot better than holding it vertically with the camera lens pressing against your palm. We noticed something odd - there's a piece of glass (or clear plastic) on the front of the lens, over the mechanical lens cover. That means you can't rely on the cover for protection from smudges and the glass can get scratched too. We hope this is some sort of reinforced glass that will be durable enough to survive in the long run though. Anyway, to further emphasize the camera-centric nature of the device, there's a tripod mounting hole at the bottom. There's a small stopper plugging it when not in use, but since it's not attached to the camera you should be careful not to lose it. This can be used in situations when you need a steady shot (e.g. time lapse videos). The Optical Image Stabilization is usually good enough for a handheld night shot. The Samsung Galaxy S4 zoom is quite thick and heavy compared to a modern smartphone, but still pocketable, unless you're wearing tight jeans. You might want to consider using the lanyard eyelet instead and carry the device like a regular camera.